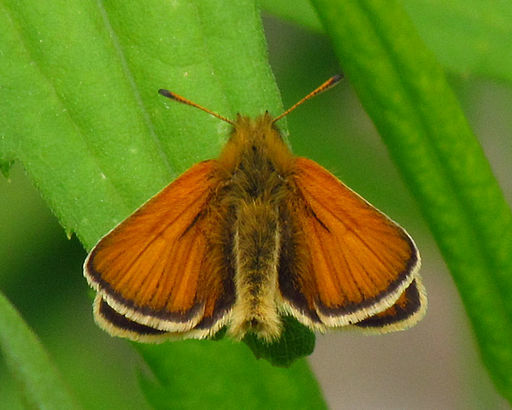 Two mornings ago, I was in my garden watering my potted plants when a lovely orangey-brown European Skipper butterfly landed on my chest. It’s head was pointed right at me and I could tell it was studying me. It was friendly encounter and I felt warmth and affection for this little brother or sister. The Skipper stayed on my chest watching me for several minutes. It’s proboscis didn’t probe for nectar. Nor did its feet shift to taste the chemical composition of my tank top, as if the butterfly wanted to lay eggs. It sat, rested and then flew off. I don’t have a photograph of the Skipper as I didn’t dare move or reach for a camera. The Skipper probably would have left immediately. It would have made a great photo with a butterfly staring at me from seven inches away. That’s to D. Gordon Robertson for sharing this photo on Wikimedia Commons.